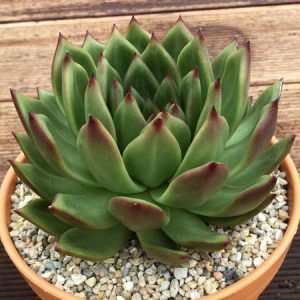 One of the species widely used in hybridisation, Echeveria agavoides is a rosette forming succulent from Mexico. The species itself has green waxy foliage, fleshy and with a small spin on the leaf tip. It is the many hybrids and cultivars that are most widely seen for sale. The species itself is variable, and the varieties available even more so. This is a plant that will flower, however it is the foliage that is the main attraction. Flowers rise above the foliage on stems and are a rosy pink with yellow interiors. The flowers are bell or lantern shaped and flared. Although succulents are seen as tough drought tolerant sun loving plants, proper care will ensure more attractive growth and longer life. Echeveria are not a plant that handle frost very well, they also do not like overly humid conditions. They like sun, however not hot afternoon sun, particularly in warmer climates. They require light, so although they can be grown indoors, good light is essential. Good drainage is also essential, so a specialist potting mix is used by most growers. A little fertiliser only one a year will be enough, over fertilisation can cause excessive leaf growth and foliage burn. 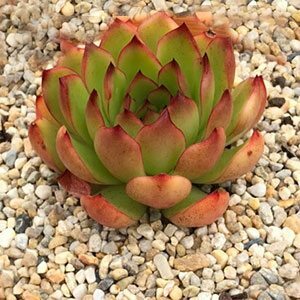 Most E. agavoides are grown in containers, don’ be tempted to overpot them. The trouble with over potting is that the growing medium can retain to mush and constant moisture, this can cause fungal diseases. Propagation is easiest by removing offsets. It is also possible from seed, and from some varieties by leaf cuttings. Common Name – Wax agave. Position – Full sun to afternoon shade, good air flow. Foliage – Green to red with spiked tips – varies with cultivar. Many cultivars are sensitive to humidity.